Last week, NHL, JSL and I made pita pizzas for dinner. As young kids, they can tend to limit the foods they want to eat. JSL, for example, would eat Macaroni and Cheese for breakfast, lunch and dinner if we let him. Yet, they also like doing things with me and my hope is that cooking with them will help expand their culinary horizons. 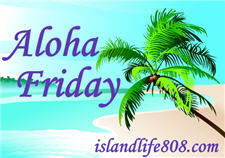 My Aloha Friday question for this week is: Do you cook with your kids? If so, what have you made with them? I prefer to let you cook with the kids 😉 Of course, this summer I hope to bake with them from time to time. .-= TheAngelForever´s last blog ..Presents and Thank you notes =-. I love to cook with my kids! We just cook some esy things or I will let them help stir or something like that..
My children are grown but when they were young I loved cooking with them. I did on the days that I was relaxed and had the patience. My eldest son remembers and today he loves to cook! .-= Janet F´s last blog ..Aloha Friday #23 =-. .-= Harriet´s last blog ..A Breath of Fresh Air as Bloggers Unite 🙂 =-. I bake a lot with my kids, cookies, cakes, buns. Other foods, that include meat…I don’t let them near. Yes, I cook with my girls and also bake. .-= Annie´s last blog ..Friendly Friday Follow … Week 1 =-. Make cookies and pancakes with critter and my teen love to make chicken, pasta dishes. .-= Auntie Ea´s last blog ..Wordless Wednesday- Killer Whales =-. It’s hard for me to figure out what to NOT let Abby help with! She has even begun to cut veggies with scissors. She PB&J’s the toast I make for her and has had a hand in all stirring since she was 18 months old. Now she is an old pro, even cracks eggs better than I do! Hope you find something fun to involve the boys with! .-= RobMonroe´s last blog ..Wordless Wednesday – Cutie =-.